A 1912 article from The Sun exclaims that there are “…more farmers in New York City than bankers.” It goes on to describe three kinds of farming activity taking place in the City. “Real farmers” meaning amateurs and children who produce crops for sale. Those backyard gardeners who grow food for their own consumption either in their own yard or illicitly in vacant lots without the owner’s knowledge or permission. School and community gardens like the farm garden at De Witt Clinton Park. By all accounts, gardening in New York City was not economical at all. An agricultural expert interviewed in the article noted that one 50 by 100 foot plot in University Heights, Bronx, which was worked by three families on a vacant lot worth $5000 and taxed at $100 per year produced less than $25 worth of vegetables annually. Certainly, the families would not have been able to afford the rent and it was doubtful that the property owner knew about the garden. Moreover, “Manhattan soil which has not been cultivated for years and which has become hard as rock needs five times as much manure and twice as much commercial fertilizer as country soil.” Since it was, and still is, against the law to store fertilizer in Manhattan, add in the cost of transporting the stuff from outside. The amount of clearing and work in sweetening the soil was estimated to be $500 to improve the average vacant lot to be suitable for farming. And yet gardening was happening all over the city. Richmond town, Staten Island, had a “poor farm” of 10 to 12 acres. Manhattan had five farms, one of which was used by 2,000 school children on two acres of land. This of course was the De Witt Clinton Park farm garden, once “the sink of Hell’s Kitchen”, “an open waste place at 54th and 12th Avenue,” “cherished haunt of a local gang known as the Sons of Reet.” Of course the police expected extra trouble when they learned a garden was being planned. But they were soon proved wrong. Mrs. Fannie Parsons acquired a street breaking plow to level and break up the soil, carting away tons of bottles, cans, wire, rags and lime. She had planned to clear seven acres but ended up with a plot of 84 by 114 feet. On this land with one teacher and zero tools (children used clam shells to clear the soil) the De Wit Clinton Park farm garden was born. The yield and the fact that no major incidents occurred ensured that the garden would be made into a permanent feature of the park by 1905. Other gardens soon followed. In 1909, Bellevue Hospital created a school garden to be cultivated by children ill with tuberculosis. In 1910, PS 177 in Brooklyn had a garden near the Brooklyn Bridge. 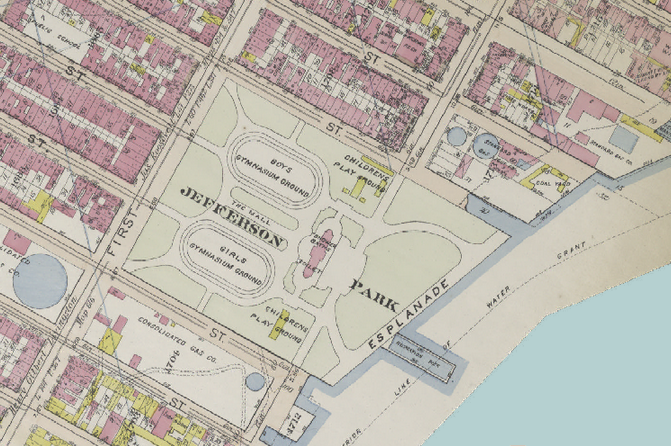 The biggest was built at Thomas Jefferson Park at 111th Street and 114th Street at the East River in what was then “the heart of Little Italy.” This garden served 1,017 boys and girls on 1,017 four by eight foot plots. It was so popular they had to bring the children out in two shifts. The site “…used to be a summer bedroom for men of the kind whose room is better than their company”. 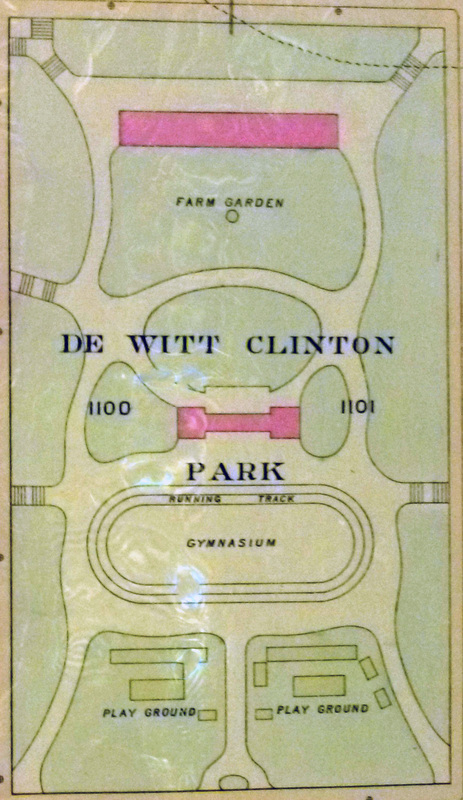 The police again suspected trouble, and yet as with De Witt Clinton Park, they found none attributed directly to the garden. There were murders. Three of them. And “night sleeping” was common, but no reports of trespassing or stealing and the garden itself was untouched. The police reportedly made a public apology. The School Farm League subsequently formed under the direction of Mrs. Parson’s son, Henry. Mr. Parsons became the director of the Department of School Gardens at New York University and taught its course at NYU’s University Heights campus at 180th and Acqueduct Avenue in the Bronx. Students at the first Spring semester course included men and women, with half coming in from the suburbs. A Summer course for teachers was established with the aid of private funds in 1906. This course trained teachers from all over the country in five gardens connected to the city through the parks department. Pratt Institute in Brooklyn followed with a garden lab developed for its domestic science course. The garden would specialize in greens which apparently do well in low sun. The specialties included spinach, chard, dandelions, beet tops, mint and horseradish. The National Highways Protective Society loaned a two acre garden at 66th Street between first and Second Avenues to be cultivated by school children. In fact, school and community gardens were catching on nationwide. In 1911, Minneapolis was a place where entire families engaged in community gardens on 600 acres of vacant lot on one side of the main street for two miles. 18,000 people from mixed cultural backgrounds (Jewish, Norwegian, German, as well as more established Americans) started home gardens, which gave this diverse community something to talk to one another about. Yonkers started an innovative children’s garden in 1903. In summer, 600 children kept 10 by 16 foot garden plots. These were leveled in the Fall after harvest for games and flooded in the Winter for ice skating. In Worcester MA, 800 plots were dug at the charmingly named “Dead Cat Dump.” Cleveland had eight school gardens and distributed 500,000 seed packets to home gardeners as a way of promoting gardening. These gardens became even more important at the dawning of World War I. So called “victory gardens” helped alleviate pressure on the food supply and served as a morale booster. Similar effects can be seen in gardening projects in the now bankrupt Detroit, whose citizens organized informal community gardens on vacant plots. More information on that effort in the Green Movements page of this website.